Design Log: Good or Bad? Why Not Both? As with Seven of Nine, this is the story of a card that I found particularly inspiring. However, unlike with her, this one didn't take nearly as much work to get right. Sometimes things just work the first time, so this is the story about how it worked. Treachery Bajorans are all about taking cards out of the discard pile. Assassins are all about returning to hand to kill somebody. She's also a religious zealot who thinks she's doing the right thing, so maybe she does something that "seems" like a good-Bajoran thing (using cards in the discard pile), but actually works as an evil-Bajoran thing? For attributes, she's fairly smart, not entirely evil (mostly just misguided, though she did kill somebody), and average Bajoran strength. Assassin. 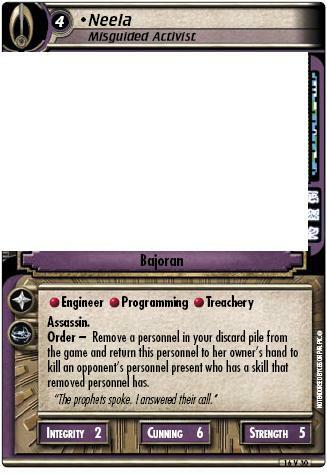 Order - Remove a personnel in your discard pile from the game and return this personnel to her owner's hand to kill an opponent's personnel present who has a skill that removed personnel has. "The prophets spoke. I answered their call." Her Integrity was dropped by one (she's still a murderer, even if she thought she was Joan of Arc), and her cost went up by one (only Brad is privy to the costing matrix), and she was sent to the playtesters looking basically the same. Oh, and apparently her subtitle changed, too. Pity, I enjoyed the irony in my first proposal. Ah well... After the first round of feedback, it was generally agreed that she was much too expensive. So, apparently even Brad doesn't understand his own costing matrix. ;-) The cost dropped by two, and ... well, that's it. The end of the story. The card was basically published straight off the drawing board, because after months of further testing, there were no problems with it.